When listening to music, especially the kind that is easy to dance to, it is not difficult to “get” the idea of being “danced by music.” Now, the idea of being “danced by Spirit” is just a progressively deeper dive into the subtleties of sensations and vibrations created by the movement of life force in the body. What is being offered here is an initial entry point, using music and dance, to access finer and finer sensations/vibrations that move through the body…and especially the spine. This approach requires a simple noticing of sensations/vibrations of the body and then tuning into the underlying subtlety of whatever is felt. As you listen/feel into the music, notice how the body naturally wants to move and sway in rhythm to its cadence. However, before getting up to dance, feel into the subtle sensations, into the grand central source that activates the desire to dance. This acknowledgment of the shift in awareness is important because it provides the momentum to go deeper still. In other words, the noticing and acknowledgment of the mind going into trance provides impetus and reminder to go deeper…and deeper…and deeper yet into subtlety. Any position/posture of the body can be explored to infinite nuance of sensations…and by relaxing and surrendering to the fine vibrations/currents moving through the body, the Divine Dance of micro movements is activated. There is then a noticing of the body moving/dancing, adjusting automatically to the rise and fall of energy. As the mind/attention focuses upon the current, there is also a noticing of how the mind is drawn inwardly, as though “captured” by the current. It is important to notice and acknowledge the dynamics of what happens when the mind focuses upon subtle sensations, upon the inner current of Life Force. Another way of thinking about how the mind can be “captured,” is to understand and experience the mind going into trance when using repetition and rhythm…such as when chanting or singing; or when losing oneself in dance. Ordinarily we don’t pay much attention to what happens when the mind gets drawn into repetitive drumming, or when we surrender ourselves in dance; or when going on long runs. However, if there is an intention to witness the body/mind/psyche going into trance, then the experience of noticing subtle shifts of awareness becomes an open pathway where each subtlety of sensation is like a “breadcrumb” leading to the next subtlety of sensation. The sensations of the inner current, as felt in the spine, holds the mind in delicate trance…focused on the gentle feeling of “upliftment.” This type of meditation is not a passive kind in which the body remains in one position, unmoving. Rather, the buildup of energy in certain areas of the body (particularly in the spine) causes the body to take up certain postures that allows for a greater flow and overflow of the life force. These movements (oftentimes in fine increments) of the body happen naturally and automatically. The mind’s connection/attunement with these subtle sensations creates a “contortion” of the life force, a buildup of energy that spirals and pulsates up the spine. It seems that by merely focusing upon the overall sensation of the body, the energy begins to build up to a point that naturally requires the body to adjust, to move in ways that allows greater accommodation of the rising tide of energy. This may look like a contortion of the body, shaking, spiraling movements of the spine, etc. This feeling of “upliftment” is a visceral, physical sensation of the life force in the spine…a lifting upwards of the head and spine and even the eyes. In recognizing the small, seemingly insignificant shifts in awareness while focusing on the overall sensation of the body, there can also be a noticing of the mind going into “trance.” What I mean by “trance” is this: the focus and absorption on the subtle vibrations and sensations of the body. In the beginning, this is important as it opens one to the experience of the inwardly flowing current of mind…and what might seem insignificant at first notice, is huge and potentially life-transforming, as the mind finally has a reference point and glimpse (however small) for latching onto the finer and finer nuances of sensations…and the accompanying experience of the inwardly flowing mind. Of what benefit is this (to connect with the subtle vibrations/sensations of the body)? Well, as one goes deeper and deeper in its connection with subtle vibrations, the awareness begins to apprehend the underlying Bliss Resonance, experienced as a kind of sweetness moving through the body. There is so much more that begins to open up, but I’ll leave it to the reader to explore for themselves the immensity of the inner vibration that is accessible to them in this very moment! When feeling into the overall sensation of the body, notice the corresponding shifts in awareness, however subtle. For example, when sitting (as in meditation pose), while experiencing the overall vibration/sensation of the body, it is important to also notice the very slight shifts in consciousness as the mind begins to tune into the finer movements of energy deep within the body. By noticing the very slight shifts in consciousness, as the awareness latches onto finer and finer currents of sensations, it gives a reference point for knowing how to go deeper and deeper into the subtle reverberations of the life force. This “reference point” of the simple “noticing/acknowledging” of feeling into what is just beneath any sensation (giddiness for example) provides an entry point for the mind to go deeper into subtle vibration. Any sensation, then, can serve as an invitation for the mind to follow and grab hold of the finer and finer threads of vibrations that then lead to deeper and deeper states of meditative trance. If you “get” on a visceral level this feeling of “falling into a swoon” there is an opening here that can be explored. When listening and feeling into music that touches you deeply, notice how the body naturally “wants” to move and sway to its rhythm. However, it is during this period that, instead of getting up to dance or to move in larger ways, to gently hold back and to move in “micromovements” as a way to focus upon and build up the energies in the central core of the body. Focus upon and feel into the very fine sensations that are activating the body to move and sway. Tune into the most subtle vibrations and experience the mind/body go into trance as it begins to feel the delicate waves and pulsations of Bliss. The consciousness that apprehends these fine vibrations understands it to be the “Pearl of Great Price!” It is the essence of all sensations felt as One Resonance…and that essence is felt as a fine thread of vibrations connected with a most delicious and delicate sensation of sweetness, deep in the central core of what seems to be the spine. This sweetness creates an energetic uplift of energy in the body, especially in the spine, holding the body/mind/psyche as though electrified…and the mind and thought processes are as though locked in place by the energetic current, which allows the “Observer” aspect of consciousness to experience little gaps of “no-thought,” the Divine Moment! This post describes the power of the human voice when used as a way to alter mental frequencies for accessing the deepest dream states and to also change for the better any difficult circumstance of our lives. We can use the human voice as “Divine Frequency Modulator” to help us gain conscious entrance to dream states and to also shift the awareness to higher planes or dimensions. The mind is habituated to certain frequencies or vibrations that it has become accustomed to. The whole experience of life lies within a certain range of resonances, and these make up the spectrum of what you relate to in life. As you learn to slow thoughts down, your frequency changes, allowing for experiences beyond the normal range of perceptions. Nightly dreams are generated from these slower frequencies. The dream states can be accessed consciously during sleep when you maintain awareness during the transition period between states. The usual habit is to fall asleep as you approach the subconscious realms. 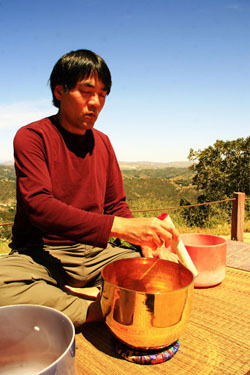 With practice, you can learn to maintain awareness as you drift into the land of dreams. It is a matter of tuning into and feeling the frequencies of sleep with awareness. When you begin to understand the dreamlike nature of the waking state, you will begin to understand yourself connected with a vastly wide consciousness that is dreaming a dream of life through you. Feel and listen now on the inside. Watch and observe; drop into the field of the wider consciousness that is all around you–everywhere. As you relax and release attachments to thoughts, you will find the energy moving of itself, expressing in ways that does not require any type of thought process that you are familiar with. Immerse now into the flow of the Creative River. It is strong and moves easily and effortlessly. Observe dispassionately. As you do so, the creative voice that wishes to express will find easy manifestation through a heart that is open to the ebb and flow of the cosmic dream. Step out of the way! As you relax and go into the deeper states of trance, you will find the energy of your Higher Self stepping into your field of consciousness. Allow this to naturally unfold as you observe within. Take note of the different states of consciousness, from wakefulness to the deepest levels of sleep and unconsciousness. When you fall asleep at night you are in effect entering a different realm of consciousness, a different frequency of awareness. When you awaken you return again to the dimension and frequency of awareness that includes body consciousness and a certain type of mindset and belief system regarding personal identity and spacial location. The body and world has a resonant frequency that you vibrate along with; and it can sometimes be difficult to change the patterns (your circumstances) even if you wish and pray to do so! The world of vibration has a way of tuning everything around it to its own rate of frequency: a noisy, discordant office with artificial light and little air circulation has very well-known negative effects on body and mind… and yet the mind does have power to change the frequency of the environment through the use of things that are also in the environment. Certain types of music can energize or relax; the sounds of nature such as waterfalls, waves, bird sounds, etc. can have the same effects. The use of drums and rattles can induce deeply hypnogogic states that can open the mind to conscious dreaming. There is also the human voice which has the range and power to deeply affect the environment and circumstances when used with the twin stallions of emotion and conviction. What gives words power? Vibration! And especially vibrations backed by calm feelings that are connected with the cosmic energy of Divine Love! If the world weighs heavily upon you, it is because the combined frequencies of fear and hate have created a vibratory quicksand that keeps you trapped and unable to move, caught in hypnotic spell of confusion and inertia. And yet the human voice has the power to shatter any spell or fetter of mind, and can change the environment when used in its role as “Divine Frequency Modulator.” Through its connection with the Divine Source the voice can move mountains of difficulties and change the course of lives! Explore the power of the voice by first intoning words of Truth with deepest feeling and conviction. Elongate the words, especially the vowel sounds and then listen and feel as the mind enters the deepest states of calm attention. Go deeper still and connect feeling, vibration and words with the Cosmic Source.